Thanks to everyone who came out last Thursday and supported all the tellers. Every month the tellers and the audience members amaze me. I love that even after knowing some of you for two or three years you can still surprise me with your stories. Dan, one of our first-timers, told us about the pitfalls of love, marriage and the TSA. If anyone out there tells you they value communication in a relationship ask them if they’ve ever climbed over a barbed wire fence and broken into a federal facility in order to tell their wife something. Lauren gave us a peek into her childhood with her story about Spartacus, The World’s Toughest Goldfish. Chris told us what happens when a stranger slips a note under your front door and you take them up on their offer. And Rob told a hysterical story of Love and Time Zones. Are you put out by having to drive to West Seattle to see your partner? Well don’t be. Rob crossed a continent for his sweetheart. If all you have to deal with is the West Seattle bridge at rush hour then you’re getting off light . Zoe shared a story about her mother and a mysterious cassette tape whose contents will never be known. The story was different from the type she usually tells and I was touched that she let us all a little deeper into her life. I could tell there were times during her story where it affected her more than she thought it would. Thank you Zoe. Carin, our New Jersey ex-pat, opened the door a little more on her life too when she shared with us how far she’ll go to stick up for her deaf students. What made it extra special was that she signed the story as she told it. That was so great to see! I don’t have space to keep telling you about all the other great moments we had on stage that night but I do want to give special thanks to all the first-timers: Julienne, Rob, Rachel, Dan and Susan. I hope each one of your comes back to tell again. Also thanks to the regulars who told that night: Jake, TC, Zoe, Chris, Lauren, Bill, Carin, Sea and David. I brought the young woman’s father on stage after her and he shared with us the heartbreaking story of just how brave that little girl and the rest of her family was having to be right now. I’m not going to go into details because it felt like the story was just for the people in the room that night. But if she and her dad are reading this I want them to know that a lot of people are keeping them in their hearts right now. Thank you for coming out and sharing what you’re going through. Our next show will be Thursday, Nov 10. (During the holidays the show is on the 2nd Thursday of each month instead of the 4th.) The theme for November’s show is “Unexpected Kindnesses.” I know it’s a short turnaround so I’ll try to get the invite out as soon as possible. While you’re thinking about that I want to tell you guys about two great story shows and a new open mic coming up. Becoming More Less Crazy is the one-man show from our regular Bill Bernat. I love this show. I’ve been 3-4 times and brought friends each time. Go see it! The show below that is Seattle Words and Music. 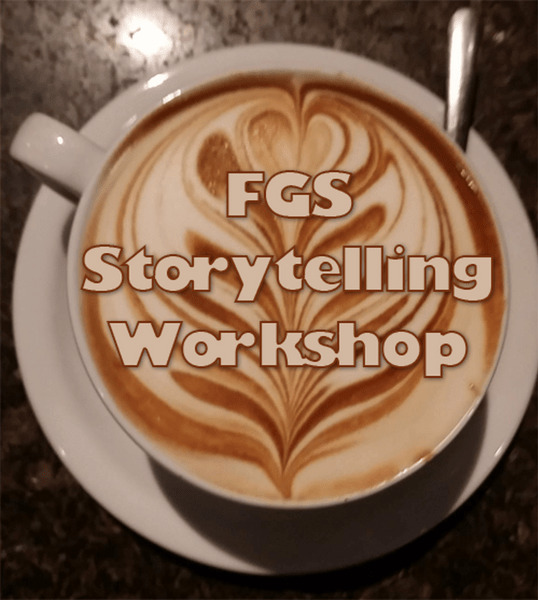 Every few months one of our regulars, David, puts together a show of all his favorite stories and tellers that he’s heard at FGS. Then he gets me to host it 🙂 It’s at a nice little theater in Belltown called The Rendezvous. It doesn’t seat too many people so you’ll want to get tickets before it sells out. The show below that is a new open mic that’s starting in Tacoma. It’s run by one of my favorite tellers and I will definitely be there telling a new story for the first night. Tacoma is a great place to perform and I’m excited to see a new storytelling open mic there. I hope I get to see some of you there on the 23rd! There are three links at the bottom for storytelling workshops. I’ve heard good things about all of them so I am happy to recommend them.